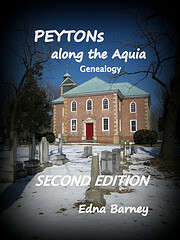 It was a member of my PEYTON family, Colonel Francis PEYTON, who was on the committee in 1795, tasked with purchasing land for a general burying ground, which became known as Penny Hill Cemetery. It is at South Payne Street, with less than a dozen tombstones remaining. This post is an answer to a query from Alan about my photograph entitled “To They Cross I Cling” which I posted at “Neddy’s Palaver.” The original image is from my album entitled “Alexandria Cemeteries.” The photo above is the sign at Penny Hll Cemetery, Alexandria, Virginia. 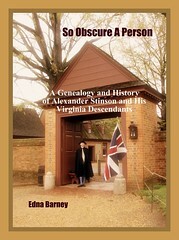 All of the other old Alexandria Cemeteries are near to or adjoin Penny Hill. I believe the gravestone described above is amongst those in the background, beyond Penny Hill Cemetery. I never thought to look for the name of the artist, however, I remember reading an extensive discussion on the Internet about the types of monuments that used the phrase “To Thy Cross I Cling,” which I discovered came from the hymn “Rock of Ages, Cleft for Me” by Augustus Montague TOPLADY, 1740-1778. This grave marker was placed in 1918, for 24-year-old Elsie JOHNSON, most likely a young victim of the 1918 Influenza Pandemic.